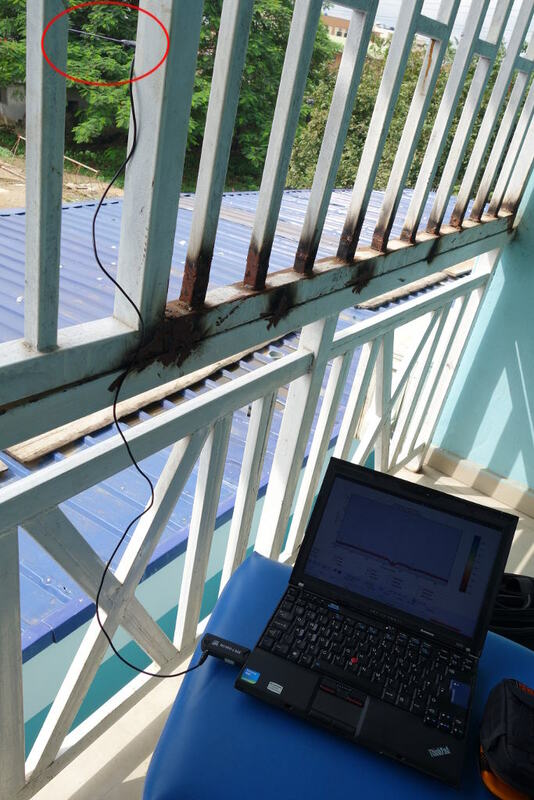 Having become a little more familiar with the RTL-SDR dongle and the RTLSDR Scanner software after a first attempt in Ghana, I had the opportunity to try out a spectrum scan in Lagos, Nigeria while at an Alliance for Affordable Internet Access event. I had hoped to do the scans from the top of the Co-creation Hub, which has a brilliant roof-top area ideal for the purpose but I got distracted by the many interesting things that they are up to and ran out of time. Instead, I ran the scans from my hotel room near the airport which didn’t have nearly the same elevation but still served the purpose I think. You can seem from the image at the left that I needed to break out of the Faraday cage of my balcony in order to prevent signals from being blocked by the burglar bars. Happily the antenna for the RTL-SDR dongle has a magnetic mount that made it easy to stick outside the bars. In case you haven’t been following along in previous posts on spectrum in general or more recently on the potential of citizen scanning of spectrum, you may be wondering why I am bothering to scan to see whether wireless spectrum is in use. The short answer is that wireless spectrum represents the single biggest opportunity for and barrier to affordable last-mile access in Africa, especially in rural areas. Yet strangely for such an immensely valuable resource, very little information is available to the public about its actual use. There are three important words to understand about spectrum from a management perspective. They are Allocation, Assignment, and Use. Allocation refers to how a particular spectrum band is allowed to be used e.g. mobile, WiFi, satellite communication etc. Most allocation is determined through processes at the International Telecommunication Union although spectrum is a sovereign issue and countries sometimes do develop variations based on national priorities. Assignment refers to who has been granted permission/rights to use a particular frequency band e.g. MTN, Globalcom, etc. This is absolutely essential information as spectrum holders need to be accountable. Use refers to whether the organisation that has been granted permission/rights to use a frequency band is actually using it. It is usually not that hard to find out the spectrum allocation plan for any given country. Often they are available as a single document such as this one from the United States. Even better is when regulators have worked to make the information more accessible and usable such as this one from the UK which not only creates a visually intuitive, searchable display but also allows the data to be downloaded in a structured (JSON) format, which facilitates its re-use. The Nigerian Communications Commission (NCC) does a better job than most regulators on the continent in terms of information they publish on spectrum allocation and assignment. There is a general document on management and allocation and then detailed information on spectrum assignments, mostly for mobile operators. Unfortunately because broadcast regulation and telecommunication regulation is managed by two separate organisations, it is difficult to get a single cohesive picture. This is now being addressed by a new joint body called the Federal Spectrum Management Council but there is no unified information resource as yet. But the one key thing that citizens don’t know is whether that spectrum is actually in use by the organisation it was assigned to. An organisation may have been granted rights to use spectrum but for a variety of reasons, may not actually be using it. As demand for spectrum increases, knowledge of spectrum that may be lying fallow becomes ever more important. The RTL-SDR dongle can’t scan the full range of wireless spectrum, which for practical purposes goes from about 30MHz to 30GHz but it does cover spectrum below 1GHz and that includes television spectrum as well as some mobile spectrum for both CDMA and GSM mobile network operators. So what the scan reveal? There’s an overview picture above and a gallery of more detailed scans at the bottom of this post. 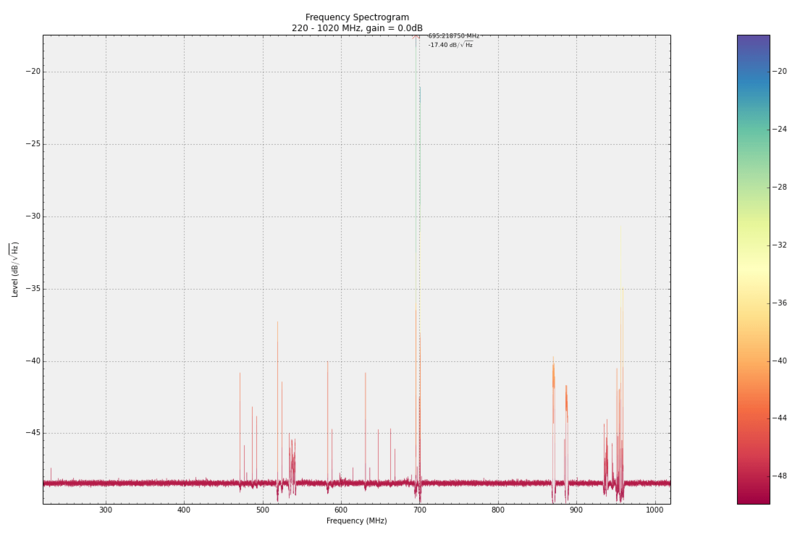 Working our way back down from 1GHz we can see spectrum occupied by mobile network operators in the mid 900MHz range. MNOs have spectrum in the 900MHz band ranging from 935MHz to 960MHz and from 890MHz to 915MHz. The spectrum is split into two different bands because the mobile technology used by the MNOs requires separate upload and download frequencies. This is known as Frequency Division Duplex (FDD) and most mobile current mobile networks are based on FDD technologies. Interestingly you can see that 935-960MHz shows a lot of activity (with the exception of MTEL) whereas 890-915MHz show no activity. The explanation for this is fairly simple. 935-960MHz is the transmit frequency for the MNOs so we would expect to pick up a lot of wireless transmission. 890-915MHz is the receive frequency which is for mobile devices to send traffic back to the mobile tower. This is much lower power than a big mobile tower and consequently unlikely to be detected by the spectrum scanner. This highlights the importance of being able to map spectrum use in coordination with knowledge of allocation and assignments. One great thing about being able to match the spectrum scan against known spectrum assignments is that it validates the evidence from the RTL-SDR dongle. Because I can match activity in the 900MHz band against known spectrum assignments, I now have a basic confidence level in the results of the scan. More about that later. Lower down in upper 800MHz range we can activity from CDMA operators, once again matching what we know about spectrum assignments in this range. As with the 900MHz band there is activity detected in the transmit frequencies and nothing in the receive frequencies. In between there is some spectrum that has been allocated to government use which appears unused at the moment. Moving down into the UHF television frequencies there doesn’t appear to be a lot of anything until you come to Channel 49 (692-702MHz) for which I was unable to find a spectrum assignee. The closest I came is an assignment to the Zamfara State TV broadcaster but that is a long way from Lagos. Beyond there there appeared to be some modest activity in the 600MHz range but I am not experienced enough at this to know whether they are of signficance or not. The next obviously significant burst of activity was in Channel 29 (534MHz to 542MHz). Again I struggled to find an assignee for this spectrum. The closest I came was Kano State Media Corporation but that too is a long way from Lagos. Channels 27, 23, and 21 also appear to have some activity but too little for me to concretely say whether there was a real broadcaster there. Overall though, looking at the full range of spectrum from 270-1020, one comes away with a sense of a LOT of empty spectrum. Surely there is a way to more speedily make efficient and effective use of this spectrum. And indeed there is. How accurate was my spectrum scan? Right now it is hard to say. While I did get validation by matching activity detected against spectrum assignments there are many factors involved in measuring spectrum. First, there is the sensitivity of the RTL-SDR dongle and its tiny little antenna. It is possible that the device simply wasn’t sensitive to pick up anything but very strong wireless activity. My location is another factor. Because I wasn’t very high up or in an open area, the dongle may have been blocked from receiving some signals. I might not have picked up some transmitters that were legitimate but still quite a long way away from me. Time is another factor. It was just one scan on one day. What if there are television stations that only broadcast at night? I wouldn’t have noticed those. Direction is yet another factor. Satellite transmitters point up, point-to-point communication is very focused, and as pointed out, we can see only the transmit half of FDD technologies. I can say something about the frequencies I did detect but not so much about what I did not detect. With a single scan on an uncalibrated scanning device, at best, I have created a conversation opener with these scans and perhaps a resource that can help people ask better questions of their government but it does not constitute what might be considered reliable data. But why should there be just one scan? What is so interesting about that RTL-SDR dongles is that while they are the very opposite of precision spectrum monitoring equipment, their super affordability (USD17) means that almost anyone can carry out exactly the same scan that I did. A hundred people could carry out a single scan in different parts of Lagos and at different times of the day and I wager we would created a picture of spectrum occupancy in the sub-1GHz band that rivals the accuracy of the best information available to the regulator. With a little investment in data standards, simple ways to upload data, and some tools for aggregating and analysing the data, one could create a picture of spectrum occupancy across the country. What a great project for graduate students to be able to work with a low-cost cognitive radio device and build an evidence-base for better informed spectrum regulation.